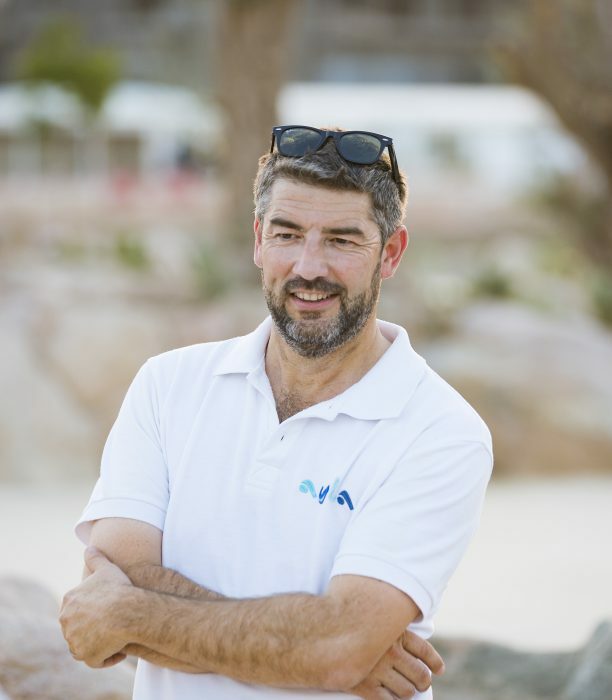 Chris is the director of operations at Ayla Oasis, the host venue for the Jordan Mixed Open, which brings together 123 golfers from the Staysure Tour, European Challenge Tour and the Ladies European Tour to compete against each other. He talks about this and his career to date. You’ve been at the helm at some of the most exciting new golf courses and developments in the Middle East. Can you tell us more about your career path through to your current position as Director of Operations at Ayla in Jordan? It was a pretty simple and humble beginning – I couldn’t get a job at the garden centre but the local golf club would allow me to dust the pro shop shelves. In 1990 I turned pro and enrolled in the PGA training programme whilst studying business, finance and marketing at night school three nights a week. In 1994 the PGA of Europe put me forward for a director of golf position to open and run Klassis Golf and Country Club in Istanbul, Turkey where I was fortunate to stage two European Challenge Tour events and one European Seniors Tour event amongst many other things. In 1999 I joined Abu Dhabi Golf Club, venue of the HSBC Abu Dhabi Golf Championship, where I was director of golf / deputy general manager. 2005 saw me move across and oversee the construction, opening and operation of the Peter Harrdine designed Al Hamra Golf Club, venue of The European Challenge Tour’s Tour championship. 2008 was a move back to Abu Dhabi as general manager of Yas Links designed by Kyle Phillips overseeing the full construction, opening and operation where we staged multiple amateur and professional events including The Invitational and Nomura Cup. Finally August 15, 2015 saw me arrive in Jordan as director of operations at Ayla Oasis Development Company a role that not only overseas Jordan’s first grass golf course but also a 300 berth marina, some 500 residential homes with facility management and technical operations, beach clubs, security, a retail village with boutique hotel (Q3 2019), a sports avenue with racket and ball sports and a soon to open adventure centre with high a ropes course, zip line and adventure mini golf. What is the golf industry in Jordan like? How many people play and how many courses are there? Golf is very new to Jordan – though a sand course has existed in Amman since the late 80s it’s very much a developing sport. Given the game of golf was thought to have first been played back in 1457 it’s wonderful to have been part of team responsible to open a countries first golf course in 2016 – our role now is to grow the game to all demographics. During your time working in UAE the golf industry boomed massively. Do you see something similar happening in Jordan? The result 20-plus golf courses delivering significant tourism rounds which helps drive a collective tourism economy. Will this happen in Jordan? There is no real reason it won’t. Of course water is scarce but desalinising the red sea for fresh water begins the above cycle and can produce the TSE water that supports grass growth. The land exists, the topography and landscapes are spectacular but it needs a joined up approach. Drive industry and create jobs = population increase needing homes who require fresh water to live. This results in waste water as a by-product = golf course irrigation water = leisure activity = desirable place to live = more people and homes = more jobs = more golfers = a sustainable golf / tourism business. What are your biggest challenges for Operations at Ayla Golf Club? Footfall. Golf is so new and there isn’t an immediate local market – we are having to create it. Turkish Airlines, EasyJet and Ryan Air now flying direct to Aqaba along with the opening of the Hyatt Regency Aqaba Ayla Resort has resulted in immediate golfers arriving from Europe. From an ‘on the ground perspective’ even our workforce of green keeping and operations staff have never had any experience or exposure to golf so that too has required a lot of training and development. Ayla will be hosting the world’s first Mixed Open in April. Can you tell us more about this event? The Jordan Mixed Open is a concept that I had and solely created some years ago but never found the right environment to activate. In light of the correct and current global movement and change in industry and leadership roles, encompassing equal opportunity to all it just felt right to introduce a ‘Mixed Tour’ event. The wonderful thing about golf is that a family of four of different abilities and genders can go out and play a competitive game together. The ‘levelling’ of the playing field can be done by handicap, length of course, angle / playability of the hole and even restricting equipment. For, what is considered as a ‘world first’ The Jordan Mixed Open will involve 40 European Ladies Tour Professionals, 40 European Challenge Tour Professionals and 40 European Staysure senior professionals as well as one amateur from each category so a full field of 123 players. The proposed course set up is 7,100 yards for Challenge Tour players, 6,601 years for Staysure Senior Tour players and 6,139 yards for Ladies European Tour players. A 54-hole tournament with a cut after 36 holes where players will go out in three balls with one player from each tour per group. Competing for 393,000$ and the bragging rights. What is your vision for the future of the Jordan Mixed Open? I believe that every professional event that gets launched has a desire to see ‘multiple’ editions and longevity and we are not ruling that out. Being so unique and a first there will need to be a collective evaluation post tournament so we can decide on next step – but we hope it will become a regular feature and may even stimulate more co-sanctioned tournaments around the world. Ayla Golf Club was constructed in accordance with eco-friendly guidelines. Can you tell us a little more about what that means and the importance of sustainability in modern-day golf course design? Greg Norman considers his Ayla Golf Club design as one of the most sustainable he has done. Water is a scarce commodity in the desert and it was therefore important that we were as efficient as we can be. Ayla golf course is currently irrigated with a blend of ‘saline’ ground water that is blended with Treated Sewage Effluent Water (common in arid regions) resulting in a purification level that sustains growth of the specially selected paspallum grass. The ground water wells are powered by Ayla’s three solar farms as are the street lighting and our par 3 floodlights – in fact the development generates more energy than it uses and thus sends power back to the grid. I have a great, full, fun and varied day. My family live in the UK so I work a seven day week here for about five weeks then pop home for a week. Sundays and Mondays I’m in Amman at our corporate head office the other days in Aqaba following the below routine. Fridays are the best day as almost no one is in the office so I can catch up. May squeeze in nine holes of floodlit golf or one of our weekly team building dinners.